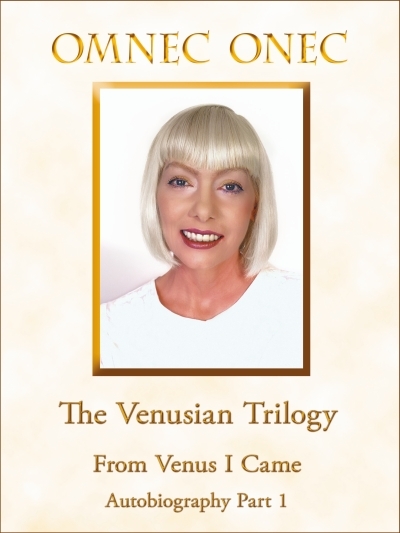 All three parts of Omnec Onec’s compilation edition “The Venusian Trilogy” with the titles “From Venus I Came“, “Angels Don’t Cry” and “My Message” are available as ebooks for Amazon Kindle. You can also find these ebooks as epubs in multiple bookstores like Barnes & Noble, iTunes, and many more. Click on the following link to order the book directly from Amazon. The books are also available in German. This ebook is the first part of Omnec’s autobiography titled “FROM VENUS I CAME”. It’s the unique autobiography of an extraterrestrial. Omnec Onec portrays her life on the astral level of Venus and teaches timeless wisdom. In the Amazon preview you can read the forewords from the publisher and from Wendelle Stevens as well as a big part of the first chapter. If you like the book, please write your review on Amazon!